Ever fancy yourself as a Luchador? The spandex-clad Lucha Libre Mexican wrestlers that remain so popular in Mexico. 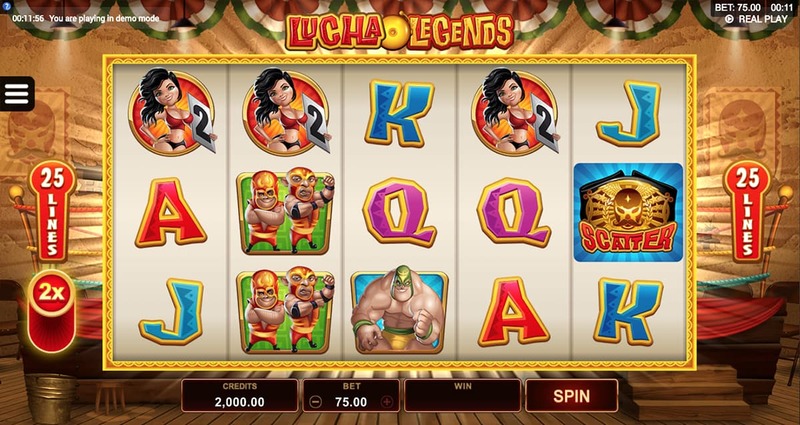 Are the stars of the Lucha Legends Slot from Microgaming and, yes, they are resplendent in their spandex. Played across five reels and 25 paylines. These musclebound muchachos give us their best shots with Super Wilds, Power Up mode and a dedicated Free Spins feature. Slam! 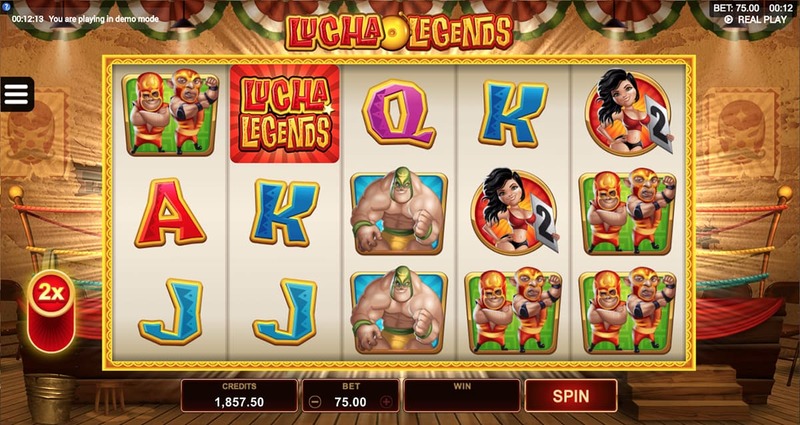 Where else would a Luchador-themed slot take place other than in a ring? The halls in which traditional luchador bouts take place are often aged, rundown affairs, and the cracked plaster and wooden floors that form the setting for this slots action pay homage to this perfectly. But expect to be transported to a modern, glamorous floodlit ring when the Free Spins action comes into play. The wrestlers themselves fittingly dorm our higher paying game symbols, and Microgaming has imbued these characters with the slots studio’s trademark sense of humour by naming them El Diablo, Burro, Martio and the double team Sal and Pepe. A scantily clad buxom Ring Girl and Referee complete the medium paying symbols, with Jacks through Aces doing the honours as our lower-paying symbols. When we trigger the Super Wilds feature, any of our four Luchadors spring up from beneath the reels or drop down from above them to perform slam-down wrestling moves and transform whole reels Wild or grant added multipliers to our wins. Epic. With simplified betting options of bet up or down, gameplay is super easy. But Microgaming also gives us a chance to boost our shots at winning if we choose to play the Power Up feature, the button for which sits gamely next to the ring. This will double our bet, but also increases or chances of triggering those Super Wilds that will either deliver multipliers between x3-x5 of any wins we have scored or transform adjacent reels or symbols Wild. Given that all game symbols appear stacked, landing just a single big win from a Super Wild activation can be as lucrative as triggering the Free Spins feature. To do this we must land three Title Belt Scatters on reels 1, 3 and 5. With 10 Free Spins at our disposal we need to rack up as many wins as we can, with Super Wilds also active during the bonus round. For every two Scatters we land we bag an additional free spin, plus we can also retrigger the Free Spins feature by landing the requisite Scatters on reels 1, 3 and 5. 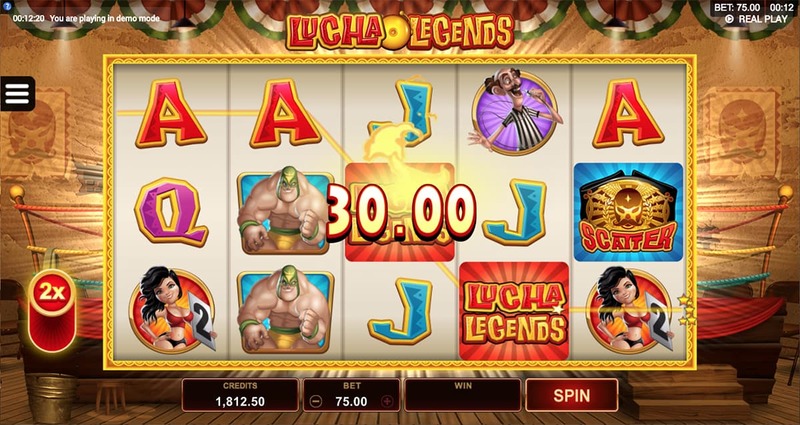 A Lucha Libre match should leave us breathless, and with its cartoonish graphics, vibrant animations and epic bonus features Microgaming’s Lucha Legends slot does just that. From the switching on of the ring lights when we play the Power Up feature right down to the nifty wobbles these characters deliver when they land on a reel, Microgaming’s attention to detail is second to none. 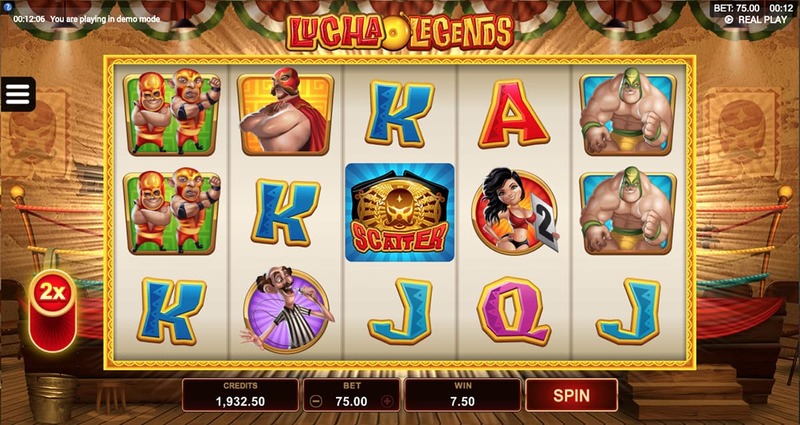 Don’t be surprised if, after playing the Lucha Legends slot, you get a sudden urge to slip on your spandex.